Is Rob Portman ‘Commonsense’ Enough To Save Ohio, Or Politically Stupid Enough To Crash It? Ohio’s junior U.S. senator and deficit hawk in Washington, Rob Portman, waltzed to an easy win last year when he used the state’s nation-leading opiate crisis as his chief campaign strategy to appear reasonable. What was unreasonable was the senator voting against a budget bill that funded his plan, claiming “wasteful spending” in other parts of the bill forced him to vote to orphan his plan that he crowed he worked so hard to get into the bill. “Commonsense conservative” Rob Portman – President George W. Bush’s budget director – is against government spending when it comes to healthcare that will trickle down as life and death issues for upwards of a million or more Ohioans. The deficit hawk in him, though, is tongue-tied when it comes to debt-busting military spending or trillions in off-budget tax cuts he put on the national credit card during his Bush Administration budget director days. History is a cruel manager of the facts, inconvenient as they may be, and the fact is that after Portman and Bush doled out trillions in tax cuts, claiming it would lead to good times for a long time, what that wasteful government spending produced was the Great Recession, the second worst economic meltdown of the last 100 years, that still haunts many states to this day. Great Job, Rob! Meanwhile, his silence on reports about other wasteful government spending, like the AP’s report that hundreds of people bilked $1.3 billion from Washington through false bills for health care, is telling but not unsurprising for its vacuousness on commitment. 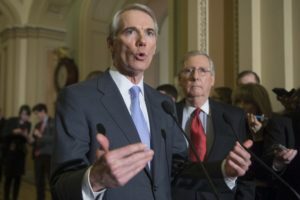 Portman finds himself caught in a big bind, much of it his own making, in light of the newest version of Trumpcare his Republican caucus leader Mitch McConnell rolled out last Thursday. Now that most of the horrors of McConnell’s first Senate bill to reform the Affordable Care Act (ACA) are still in place, in a secret bill only Republicans including Portman are privy to, if Mr. Portman wants to be a real hero he could become the third Republican to just say no to this terrible bill. It would wreak havoc on Ohioans and the economy at large if allowed to become law if or when the GOP-controlled U.S. House and America’s crazy-man president go along for the ride. Two GOP senators so far – Rand Paul of Kentucky and Susan Collins of Maine – have stated their opposition to the latest version of the American Health Care Act. If Portman does the right thing and joins them and all the Democrats who have vowed to vote no, the bill will be defeated and untold Ohio lives will be saved. If Portman does the politically right thing and says yes to a bill Republicans say they must pass to keep faith with voters who voted for them to repeal and replace the ACA, he’ll show his “commonsense” conservative credentials as just rhetoric and he’s another hostage tied to his party’s insane wing that loves to take from the poor to benefit the rich. The New York Times on Friday caught Portman in his own trap of being spineless and vague on what it takes to win his vote. How can Portman not oppose this version of the bill when it contains the same Medicaid policies in the old bill? If Portman decides to do the commonsense thing and listen to Ohio’s senior U.S. senator, Sherrod Brown – a strong voice for keeping the ACA but adding responsible and intelligent changes to it – Ohio will avoid being ravaged by another economic maelstrom that may not be as devastating as the subprime mortgage crisis but will nonetheless deliver years of grief and heartache to a state that still has not fully recovered from losses arising from the recessions of 2000 and 2008. Another informed national voice pointed out that the bill would allow people to use tax-favored health savings accounts to pay insurance premiums. “This effectively creates a big new tax shelter that mostly helps people with high incomes who (a) can afford to put a lot of money into such accounts and (b) face high marginal tax rates, and hence get big tax,” NYT opinion writer Paul Krugman recently wrote. Portman should also listen to one of the nation’s top non-nonpartisan experts on healthcare, the Kaiser Family Foundation, has to say about stability of the individual insurance market under the ACA. The repeal bill cuts more than $13 billion from Medicaid in Ohio, affecting coverage for 2.9 million Ohioans who currently rely on Medicaid for health care. The repeal bill still allows insurance companies to charge as much as five times more for people over 50 and still allows insurance companies to deny coverage for routine doctor’s visits, cancer screenings, and substance use disorder treatments. That means an Ohioan could pay an average of $1,380 more for the same coverage they have today. The repeal devastates Ohio’s ability to combat the growing opioid epidemic, leaving more than 151,000 Ohioans with mental illness and substance use disorders at risk of losing access to treatment because experts say they are failing to fund the treatment needed. Planned Parenthood remains unfunded, meaning 2.4 million Americans, including more than 81,000 in Ohio, depend on for care. Dawn Laguens, executive vice president for the Planned Parenthood Federation of America, took aim at the new bill. Also not making news is what Portman and his colleagues have stuffed into the “secret” bill that should be embarrassing. As Vox reported, Senate Republicans exempted themselves and their staff from the latest revision of the healthcare bill they released today. “This means members of Congress – who get taxpayer-funded healthcare – and their staff would have access to benefits that they are denying their own constituents in the bill,” Vox noted. Poor Rob Portman, he’s caught on the horns of a dilemma: Do the commonsense right thing for his human constituents and keep Ohio out of the economic dumpster again, or do the politically “right-wing” thing for his party and crash a state not fully recovered from two previous crashes dating back 17 years. What’s a commonsense conservative to do?